I created a simple circuit using the LM317 to output 3.3 volts from a 5V or greater input voltage. Why? Because, a number of modules for the Arduino (or Pinguino) take 3.3 Volts. 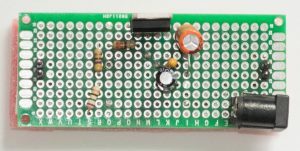 It’s true, some of the Arduinos do have a 3.3V voltage regulator (and thus a source of 3.3V), however, that might not have sufficient amperage. Also, if you are a fan of the DIY (Do-It-Yourself) Pinguinos (as I am), you will need a 3.3V source to accompany them since they do not have one. I save the foam pads, that came with PC motherboards I bought, and cut out pieces to place under the circuits I make to protect against short circuits. The pads are held in place with two-sided sticky tape. If you’d like the Fritzing source to the above diagram, download it from here. The LM317 is an adjustable linear voltage regulator. 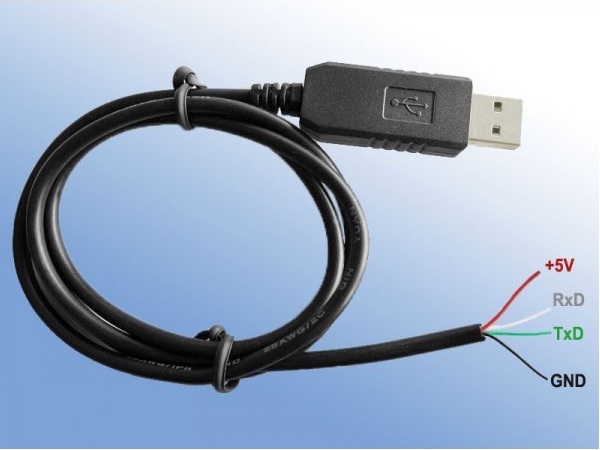 It can take an input voltage of 3-40 Volts DC and outputs a fixed voltage from 1.2 to 37 Volts DC. The output is controlled by resistors on the adjustment pin. 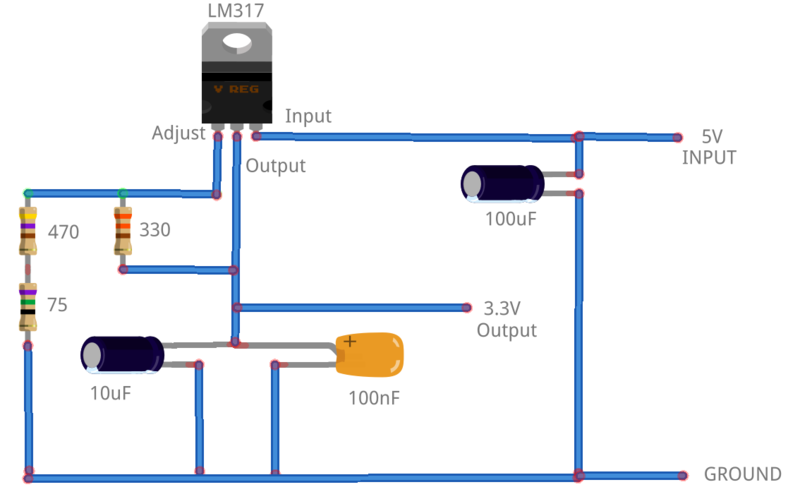 Here is a handy calculator to calculate the resistance needed to obtain the desired output voltage. I use 545 Ohms (470 + 75) to output the desired 3.3V. 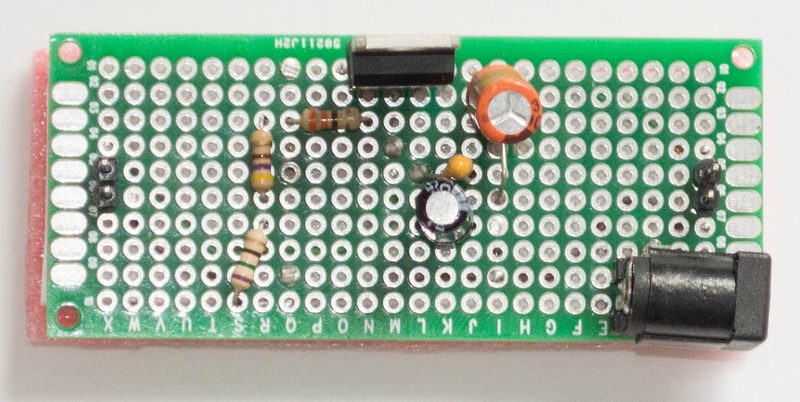 Notice that I have a two pin header or a power jack as input source (on the right of the pictures) and the output is a two pin header (on the left in the pictures). 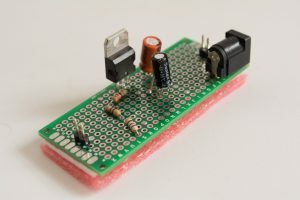 I tested this circuit using the ESP8266 and the NL6621-Y1 modules that I wrote about in earlier articles. These modules require 3.3V and both worked fine. directly to the circuit (5V Input and GND) and to the wireless module (Tx and Rcv from the cable, 3.3V and GND from the circuit) and not even need an Arduino / Pinguino. Amazing ! I built it and the output voltage is exact 3.3 V. Beautiful and great job. What is the purpose of those capacitors? The capacitors provide current when the source doesn’t. They would not be needed if the power source was perfect but is that ever the case. You can find more info about this with a search on ‘smoothing capacitors’.